Sited for magnificent views over rolling farmland out to the Kaipara Harbour, this cosy old farm cottage has had a recent modern renovation. The cottage as four bedrooms and a large common area featuring an open-plan kitchen, dining and living area which spills outside through french doors to a large outdoor entertaining area complete with sunset views. Located on unique combination of a 1400ha working sheep, beef and diary farm plus private conservation reserve, The Farm Cottage is a perfect cosy rural retreat for those wanting to get back to nature. Bring a group of friends or the whole family and enjoy the peace and quiet of rural life. A network of farm walks exploring the native bush and coastal harbour walks on Mataia Farm is accessable just minutes down the road, or head up to nearby Atiu Creek Regional Park to explore the Kaipara. Located 30 minutes from the townships of Warkworth, Wellsford and Helensville, cafes, shops, restaurants and golf-courses are close at hand. NOTE: The cottage is located on a working farm and the access driveway is shared with the farm. During the winter months the driveway can become very muddy and potholed due to stock and farm vehicle movements. There are gateways to open and close on the driveway and gumboots are essential. We strongly recommend that you take this into consideration if planning your visit in the winter months. 2 night minimum stay over public holidays. Basic pantry items provided including tea, coffee, sugar, oil, salt & pepper. Have stayed here a number of times and always really enjoy it. Jenny is a great host, and the cottage itself is fantastic. Already talking about when we'll be back again :-) Thanks. We thoroughly enjoyed our nights stay here. Very quiet and peaceful. It was just the place for all 11 of us as our Grandson and his partners combined 21st birthday celebrations were in the hall at the front of the property's driveway. I would recommend this cottage for anyone who would like to have a nice getaway. No heavy traffic noise or neighbours. The Cottage has ample areas for you to find a peaceful place for you and your book. The house was beautiful, comfortable and Jenny was a perfect host! An excellent house plan to have many guests. The Vista & outdoor table is placed perfectly to enjoy the western aspect. We took full advantage of the indoor/outdoor flow. The kitchen is a favourable size & made for user friendly cooking. The single beds were comfortable & the sheets of nice quality. Great hosts available and happy to help and recommend things to do like walks. 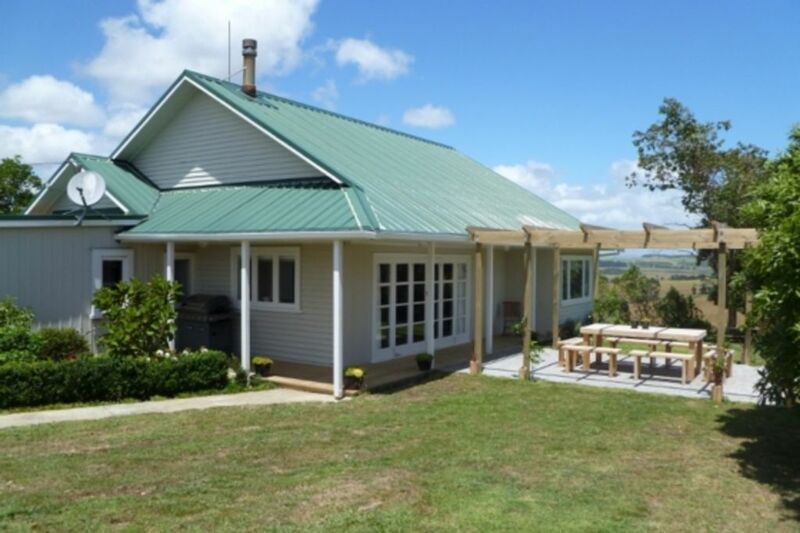 Location 1h away handy from Auckland with things to do around (sculptures walk, strawberry picking, bush walks...). House has all the essentials. Great to have all linen included. Would recommend.